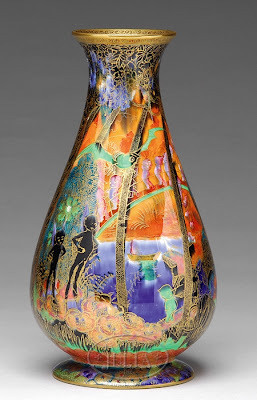 Yesterday, I shared part 1 of 2 posts on Fairyland Lustre by Wedgwood. Today is part two. As I mentioned yesterday, the best book about the Fairyland Lustre is rare and expensive although obtaining it through interlibrary load should be possible. The book is Wedgwood Fairyland Lustre - The Work of Daisy Makeig-Jones. Besides the line's unique quality, another aspect that endears it to me is that a woman designed it at a time when women were not as easily accepted in these fields. 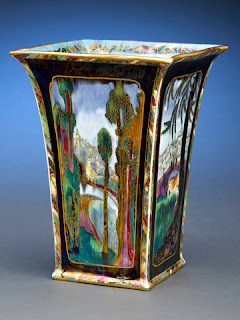 Susannah Margaretta "Daisy" Makeig-Jones (1881-1945) was a pottery designer for Wedgwood. She is best known for her range of "Fairyland Lustre" pottery. She was born in Wath-upon-Dearne near Rotherham in Yorkshire. She was the eldest of seven children. Her father, K. Geoffrey Makeig-Jones, was of Welsh origin and was a medical doctor; her mother was the daughter of Thomas Reeder, a solicitor, in Yorkshire. Both families were of the 'gentry' origin and of a professional class background. She was taught by a governess at home, then attended a boarding school near Rugby. After her family moved to Torquay she entered the Torquay School of Art. 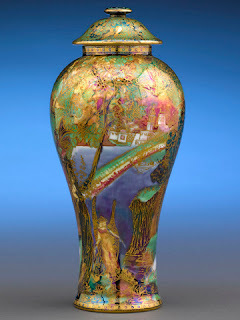 She joined Wedgwood in 1909, after gaining an introduction to the managing director Cecil Wedgwood through a relative. One of Cecil's daughters, Doris Audrey Wedgwood, married her brother Thomas Geoffrey Rowland Makeig-Jones in 1928. She retired in 1931. In 1916, Susannah Margeretta ‘Daisy’ Makeig-Jones, introduced an extensive range of some of the most extraordinary ware ever produced by Wedgwood. 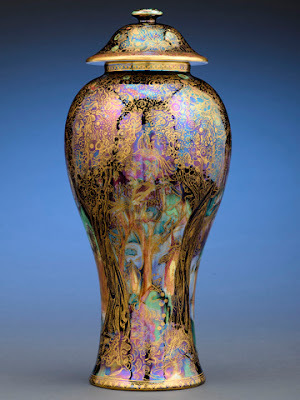 It was called Fairyland lustre and adorned a large number of shapes, some of which were made especially for the purpose. Daisy’s fairies came from many cultural backgrounds and the articles they decorate often tell complex tales. 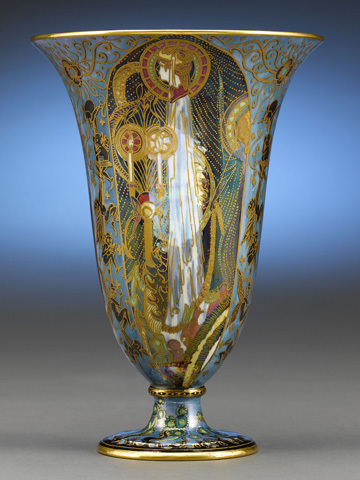 Here, on the chalice cup, we simply see elves against a sunset sky enjoying a game of leapfrog. 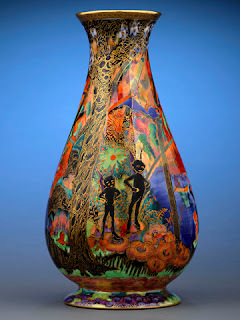 However, the simple antics of the fairies belie the technical expertise needed to make each piece of Fairyland lustre – some of which needed as many as six firings. Daisy’s Fairyland remained popular until well into the 1920s when the Wall Street crash and a change in taste saw that it was gradually discontinued. According to factory history, Daisy was asked to leave in 1930 but flatly refused to do so. She felt like a member of the family. Not long afterwards, she herself decided to leave, making the dramatic gesture of smashing her pots as she went. Daisy Makeig-Jones's fascination with fairies, following such illustrators as Arthur Rackham, Edmund Dulac and the Danish artist, Kay Nielsen, proved very popular in the 1920s. Wedgwood have always produced a huge range of styles to capture different market tastes. The cosy drawing room and nursery atmosphere of the decoration of these works, and the monumental forms, contrast sharply with the modernist works being produced at Wedgwood's in the same period. Targeting the luxury end of the market with these pieces, they represent one of Wedgwood's most extraordinary technical achievements in the ceramic industry. The richly coloured ornament of Fairyland Lustre was extremely popular throughout the 1920s as expensive collector's pieces. 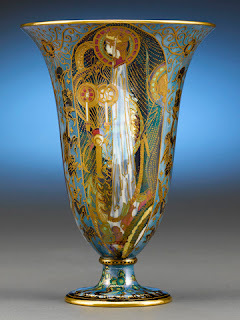 But by the 1930s the appeal of lustre was waning and the collapse of the American market had a noticable effect on the demand for ornamental wares. Fairyland was gradually phased out in the 1930s as Keith Murray and Norman Wilson were taken up. Fairyland was considered too expensive and old-fashioned. Wedgwood's rise to prominence in the 18th century was based on innovation in manufacture and designs that, despite being adaptations of classical motifs from the antique, were presented in a new form, which had broad based appeal. 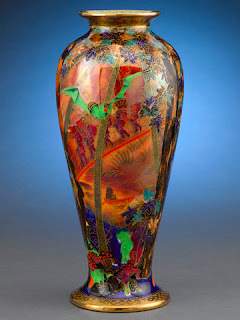 However, during the 19th century Wedgwood lacked the innovation and energy provided by its founder Josiah I, and its wares became for the most part derivative, concentrating almost exclusively on production of its traditional basalt and jasper wares. By the early 20th century, the factory was nearly bankrupt. The key to its survival to a very large extent was the development, in the early 1900s, of a dazzling range of new glazing techniques, particularly one which produced a finish of multi-coloured iridescence. The catalyst for change at the company's Etruria works in Stoke-on-Trent was Daisy Makeig-Jones fairies. They were loved by some and hated by others, indeed, some thought she was mad, but without doubt, they helped Wedgwood return to profitability after the First World War. Daisy's art school training helped Wedgwood grow and by 1914, she was considered good enough to be given her own studio. Fairies bring good luck, they say. Daisy's run of luck began when she was paced in the studio next to the one where trials of new glazes were taking place. Glazes that were to add so much to her inspired designs. There, she was able to watch the paintresses at work and pass to them watercolour drawings of her Fairyland ideas so that, in effect, they became part of the experiments. In fact, Daisy carried out her own test firings with glazes of different colours and lustres that were later adopted when production began, just nine months after being taken on as a staff designer. Rich blues, purple, orange (her favourite colour) yellow, green and gold, were all worked together with pixies, elves and sprites in ways reminiscent of book illustrations by Edmund Dulac and Arthur Rackham. And, like all clever, well constructed pictures, the harder you look, the more you see: elves playing leapfrog; spiders spinning evil webs; gaudy rainbows over romantic castles; ghostly woods and apparitions in the Land of Illusion. Interestingly, rather than being figments of an over active imagination, many Fairyland Lustre designs have strong links with folklore, legend and tradition, though clearly, Daisy's fairy people did things their way. The Wedgwood factory gave Susannah Margaretta (Daisy) Makeig-Jones (1881-1945) her own design studio in 1915. 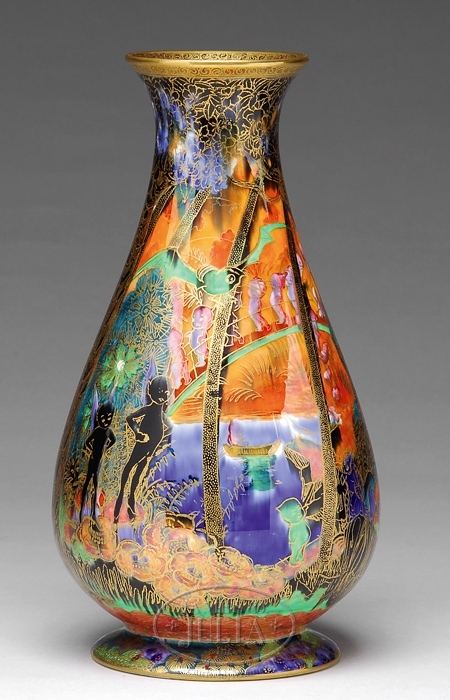 Drawing on her early love of fairy stories, she introduced an imaginative line of decorative wares that remained popular throughout the 1920s. This particular design was introduced in 1924. Engravers transferred Makeig-Jones's designs to copper plates for printing onto paper sheets known as pottery tissues. While the ink was still wet on the pottery tissues, the images were rubbed onto the ceramic surfaces. 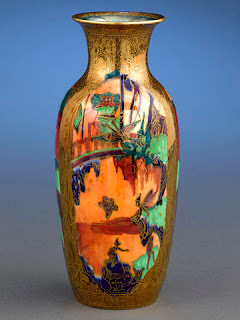 Women painters then applied the colors to these designs on the ceramics, a process that necessitated several firings, and then added the colorful glazes. The gold details were added last. So the Fairyland Lustre saved the company (which is struggling again today) and has remained a highly collectible item. I highly recommend hunting for a piece the next time you visit a museum. They are fun to look at and study with their details and colors. I am a new reader of your blog. I love everything so far. 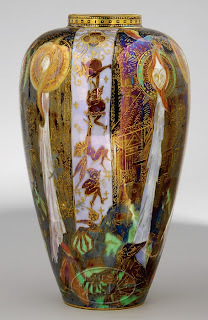 Just so you know, the New Orleans Museum of Art has a small selection of Fairyland Lustre ceramics by Wedgwood on view. I've never been to B'ham's museum even though I live in Mobile. I'll have to check it out sometime :) Thanks for your posts on this subject. It is coming up to a 100 years since the first true fairyland lustre items left the Wedgwood factory in c 1916 ,hopefully the V&A will mark it with a stunning display of fairyland . It looks good in pictures but just wait until you see it for real , simply breathtaking .